A large pit in the Marius Hills of the moon may be a skylight leading into a subsurface cave known as a lava tube. Skylights could provide astronauts with an entrance to a lava tube, where they could seek shelter from the harsh lunar environment, researchers said. Moon caves could provide shelter for astronauts exploring Earth's nearest neighbor, researchers say. A new analysis of data gathered by NASA's twin Gravity Recovery and Interior Laboratory (GRAIL) spacecraft, which mapped the moon's gravitational field in unprecedented detail, turned up a number of new candidates for lava tubes — cave-like structures that could be large enough to house supplies and astronauts. Space is a harsh environment. Radiation from the sun, galactic cosmic rays and constantly falling micrometeorites all present a threat to human explorers. "A lava tube provides a safe haven from all these hazardous environmental conditions," study team member Rohan Sood, a graduate student at Purdue University in Indiana, told Space.com. Sood presented more than a dozen potential lava tubes at the 47th Lunar and Planetary Science Conferencein The Woodlands, Texas, in March. This graphic shows the city of Philadelphia sitting inside a lunar lava tube, illustrating how huge these subsurface features can be. Lava flowing across the moon's surface can harden into a protective shell. When the interior of the shell collapses but the hollowed-out shell remains, a lava tube is created. Skylights, which are formed from the partial collapse of a tube, should also be larger under the moon's lower gravity, enabling an easier exploration of lava tubes, researchers said. The two GRAIL probes precisely mapped out the moon's gravitational field from orbit from March 2012 through December 2012. Because gravitational pull is related to mass, a hollowed-out region such as a lava tube tugged at the spacecraft slightly less than did solid ground. In the new study, Sood and his colleagues studied GRAIL data to search for small differences that could indicate the presence of lava tubes on the lava plains, or mare, of the moon. First, the team targeted previously identified pits on the near side of the moonthat could double as skylights. Observations from GRAIL suggested that two of these pits could be connected to lava tubes. The new research revealed that the skylight in the Marius Hills regionis probably connected to a lava tube beneath. Next, the scientists searched the lunar mare for signs of lava tubes with no visible surface features. They found at least 10 large candidates, some nearly 1 mile (1.6 kilometers) wide and stretching over 60 miles (100 km) in length. But even more tubes that are too small to be picked up by GRAIL could exist as well, Sood noted. That means that lava tubes smaller than about 0.5 miles (1 km) wide could easily escape detection. Large channels, known as rills, fed the large lava fields on the lunar surface. Stretching as much as 2.5 to 3 miles (4 to 5 km) wide and measuring up to 0.33 miles (0.5 km) deep, the features are enormous, compared to terrestrial standards. "We find nothing of comparable size on the Earth," Melosh told Space.com. The enormous rills suggest that lava flow rates on the moon were higher than those of Earth, and that lava tubes should therefore be more plentiful. The lower lunar gravity also means that large lava tubes should be more stable than those found on Earth— less likely to collapse. This could explain why so few skylights have been detected, researchers said. "An analysis of the stability of lava tubes finds that lava tubes 5 kilometers wide on the moon and 3 kilometers high are perfectly stable," Melosh said. He described how the author of that research, David Blair of Purdue, showed that a lava tube big enough to contain the city of Philadelphia would be stable on the moon. "That's a little bit of a surprise," Melosh said. Human explorers haven't set foot on the moon since the Apollo 17 mission in 1972. When astronauts return, lava tubes may help them settle in comfortably. But such sites should be studied and vetted by robotic spacecraft before humans are sent there, Sood and Melosh said. "We would like to send a radar-based mission," Sood said. "That will give us the possibility to recognize those lava tubes with much more clarity, and potentially find lava tubes that are smaller, that are beyond the resolution of GRAIL." Hunting for more skylights on the moon would also help, as these features make it easier to explore lava tubes. "If we already have an access point, that gives you a better chance of going into [a lava tube] than excavating," Sood said. 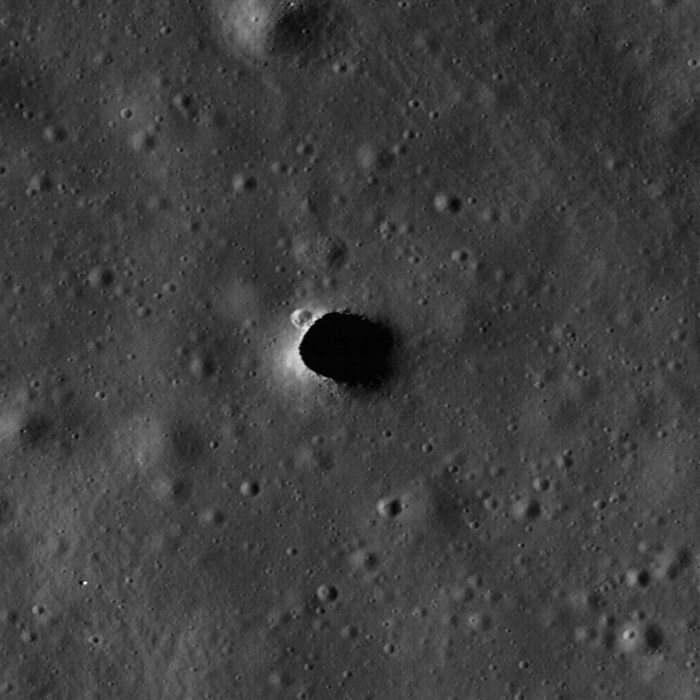 The lava tube associated with the skylight found in the Marius Hills region of the moon is large, Melosh said. That doesn't mean it's completely empty. A radar search could not only verify how far lava tubes stretch but also determine if cave-ins have blocked them off. Rovers could then explore a candidate lava tube. All of these steps are necessary before humans are sent on a lunar camping trip. "You don't want to set a bunch of astronauts down with a drill and have them drill into something and find it clogged with rubble," Melosh said. Lunar lava tubes also provide an excellent opportunity for scientists to learn about off-planet living before astronauts are sent to Mars. Skylights have also been identified on the Red Planet and could help astronauts settle in for long-term missions. The moon "will give us an opportunity to learn about lava tubes before we try to do anything on Mars," Sood said.